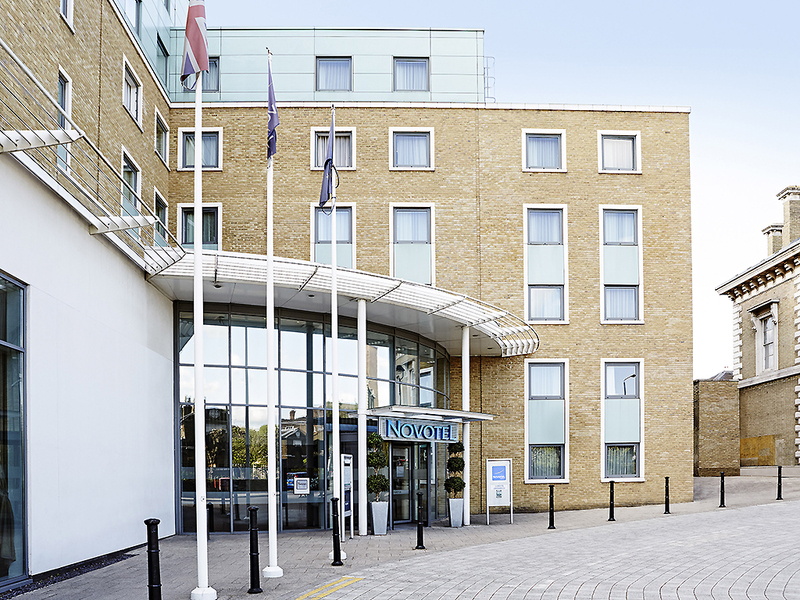 Discover the stylish elegance of the Novotel London Greenwich hotel, which features bright, spacious bedrooms and colourful artwork throughout. Neighbouring Greenwich tube station, the 4-star hotel is a great choice for travellers interested in live music, riverside walks and nightlife. This modern hotel offers private on-site parking and boasts a fitness centre, a stylish restaurant, and spacious bedrooms. Please note that the hotel will be undergoing a façade enhancement from January 2019. Located in the Royal Borough of Greenwich, the National Maritime Museum and the Royal Observatory are unmissable attractions. Entertain your palate at the in-house bar & restaurant where you can enjoy a range of local and international cuisine. The modern leisure complex features a fully equipped fitness centre, a steam room, and a relaxation area. After a workout, absorb the lively atmosphere of the bar with its stylish surroundings and wide-selection of beers, wines, and cocktails. Please be informed that the hotel will be undergoing a façade enhancement till 30th September 2019. The room was good, comfortable beds and maintained at a reasonable temperature. As a family, we had two rooms and our request for them to be close was met as they were opposite each other. Breakfast was good. When we arrived, late afternoon, there was no space available in the car park and no suitable alternatives nearby. We went out for the evening and, fortunately, a space was available on our return. One issue with the rooms is that, while a separate toilet can be useful, it would be better if there was a washbasin in the lavatory. Room clean but sofa bed was uncomfortable due to springs being close to outside of the mattress. I have stayed here with work a few times and was so impressed with the service I brought my family for a weekend. All the staff provide exceptional service that makes a difference. Staff was extremely rude and very unprofessional to say the least. We had checked in late at about 23.00 and she was so disinterested in assisting us: gave yes/no questions and appeared very sleepy. When asked about nearby places to grab dinner from she said that she had no idea. I understand that she might have been tired or going through something but it was her job to assist us with our stay and being in the hotel industry, a welcoming personality should have been the bare minimum. I am extremely disappointed and this one staff has completely ruined Novotel’s brand in my book. Staff was friendly water quality was poor. The water running though the bathroom sink smelled like a sewer. Horrible quality when we returned home we discovered our daughter had worms. She's still I'll. I don’t understand why you only call one car service for your clients even when they want a London black taxi cab. Your company does not know London well and got lost taking me to an important business dinner. I asked for a London Can because they know where they are going and you said no, I could only use the Novatel service. That is ridiculous. Give us a choice! As good as I have expected. The overall two-night stay had been a joyful experience and my family enjoyed ourselves very much during the stay. I checked in at 6.30pm for a one-night stay. The check-in operative was incredibly polite and apologetic for my long wait checking in (there was a long queue and she was the only person on the check-in desk). I went to my room to prepare for an evening function at the Painted Hall to find that the view out of my room was a wall of scaffolding. I had not been warned about this on booking or at checkin. I was in such a rush that I couldn't complain at the time. I went to shave, and found the sink was totally blocked. The room air was uncomfortably warm so I set the cooling to maximum and left for my event. I returned at around midnight, to find the air stiflingly warm. I couldn't sleep for that reason. Additionally, I was kept awake until 3am by the sound of the trains at the station. For a hotel in such close proximity I am amazed the soundproofing in the windows isn't better. I raised my concerns on checkout, and was told that they had been instructed not to mention the scaffolding but to recommend those who are dissatisfied get in touch with customer services. I think this is a truly shocking approach to customer service. Based on this experience, I will not only never stay at an accor hotel again, but will actively warn business contacts and friends about my experience. We had a mishap of booking a room here for two persons while in fact my husband and I were traveling with 2 teenagers. The counter attendant were able to find us a room that could fit 4 people with two beds. When we were at our room the beds were already set up for our teenagers. We were charged for $20 more dollar, I think this is due to the exchange rate. The only downside was breakfast was not available until 7 am while we had to be out the door at 6:30 am to meet our Expat tour. Again it is part of my mistake for purchasing the breakfast included room without knowing the time it was available. I don’t remember the website saying anything about when the breakfast was available. Anyway, it was a short stay and the service was effective. I booked the suite was very lovely staff very attentive. No information on the website as to where to find the car park. When checking in there was no explanation of the £119 holding fee, they just took it. When I noticed the pending payment on my online banking I called to enquire, waited on hold only to be hung up on. When I did manage to get through, the last said it would be refunded in the next 5 hours. 5 days later I still haven’t had the holding fee returned. Hotel was nice and clean, modern. Service was good and staff were very friendly. Location was convinient for Greenwich tube station. However this meant you were practically on the tube line, and there were trains going past late at night and very early in the morning. Added to this there was building work going on where they were drilling much later than I think is acceptable.